Wow it's been a year... works perfectly. I expect it will for years to come! Nice, solid product. Easy to install and remove. Sliding action is very smooth, easy to extend and fold. My hitch coupler is slightly different design than shown but seems very heavy duty. Very nice looking tow bar; quality seems quite good. Have not put it in use as yet, but do not foresee any problems. The tow vehicle is a Thor ACE 29.3; "toad" is a Nissan Xterra (manual trans.). Bought Demco's baseplate and have it installed and ready to go. Only issue is the height difference between the hitch on the ACE and the baseplate mounts: Baseplate mounting tabs are 23" above ground level; hitch receiver is 15". With the tow bar tongue flipped to rise 1 1/2", I've ordered a 6" rise adapter for the receiver, so all should be good. Great product, so far. Haven't used it yet. Looks solid and well made. Heavy and doesn't collapse very small. 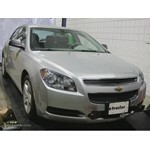 Today, we're going to work on a 2012 Chevy Malibu. We're going to be installing the Roadmaster Base Plates, part number 523145-5. For the easy installation, we've gone ahead and jacked up the vehicle, removed the front wheels and opened the hood. Our first step is going to be removing the upper plastic piece that covers the radiator and core support. We've got some bolts to remove and plastic fasteners. I'll start with my plastic fasteners. Today in this 2012 Chevy Malibu, well be using a 6-Pole Round Pin Connector, part number PK11609 and Diode Kit, part number 38955. Were going to install our 6-Pole Connector here in this space, so first Ill need to remove the lower panels so I can start routing my wire. When routing our wire, we're going to be careful to stay away from pinch points such as the suspension or steering, or extensive heat such as exhaust. Im going to use a piece of air line or pull wire to help me thread it through the frame here of the vehicle. We got our wire run to the back of the vehicle, now we need to get up into the trunk area so that we can attach it to the manufacturers wiring. To do that, were going to need to pull apart some of the rear interior. The Roadmaster Falcon Tow Bar part # RM-520 would be a great choice for a new tow bar. This is one of our most popular tow bars that would work great with the Roadmaster base plate kit you have installed on your 2015 Chevy Malibu, part # RM-523178-4. 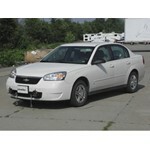 We do indeed carry the stoplight switch for a 2004 Chevy Malibu w/ the adjustable pedals. The part number is # RM-751210. The RM-520, Roadmaster Falcon 2 would be a great choice. You will also need the 'invisible' base plates for your Malibu, part number 194-3, which you can see by clicking the link I've included below.